1. SOC-3A Unit: VS-201, US Navy. Serial: 201-S-2. 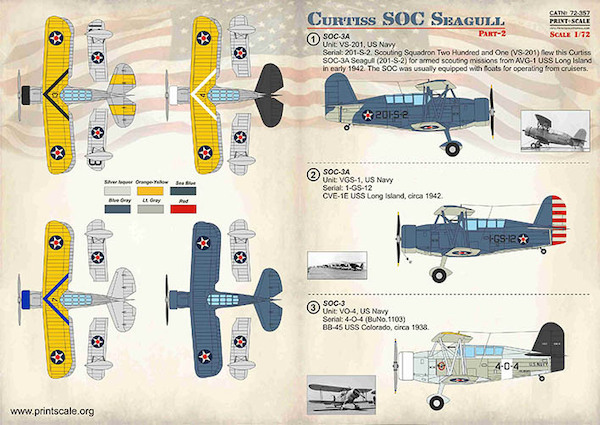 Scouting Squadron Two Hundred and One (VS-201) flew this Curtiss SOC-3A Seagull (201-S-2) for armed scouting missions from AVG-1 USS Long Island in early 1942. The SOC was usually equipped with floats for operating from cruisers. 2.SOC-3A Unit: VGS-1, US Navy. Serial: 1-GS-12. CVE-1E USS Long Island, circa 1942. 3. SOC-3 Unit: VO-4, US Navy. Serial: 4-O-4 (BuNo.1103) BB-45 USS Colorado, circa 1938. 4. SOC-2 Unit: VCS-7, US Navy. Serial: 7-CS-13 (BuNo.0387) Heavy cruiser CA-37 USS Tuscaloosa, circa 1939. 5. SOC-3 Unit: VMS-2, USMC. Serial: 2-MS-6 (BuNo.1126) NAS San Diego, circa 1939. 6. SOC-3 Unit: VMS-2, USMC Serial: 2-MS-7 (BuNo.1127) NAS San Diego, circa 1939. 7. SOC-1 Unit: VCS-5, US Navy. Serial: 5-CS-13 (BuNo.9866) Based at heavy cruiser CA-28 USS Louisville, circa 1938. 8. SOC-1 Unit: VCS-6, US Navy. Serial: 6-CS-8 Based at heavy cruiser CA-34 USS Astoria, circa 1941. 9. SOC-3 Unit: VO-2, US Navy. Serial: 2-O-4 (BuNo.1065). The battleship BB-44 California, circa 1938.